This one example really gets you thinking. Anytime there is a significant change in your life or a parent’s life, consider discussing ith an elder law or estate planning attorney. Being proactive isn’t always easy or pleasant, but it can head off gut-wrenching issues that will occur at some point, especially if you have elderly loved ones. Making sound decisions in the midst of crisis is not the optimal time to think clearly. Now that school is back in session and Labor Day is over, it’s time for us all to get back into our routines which we abandoned in the heat of the summer. Here are 7 tips that I want you to add to your routine this fall and winter. Make sure someone knows the location of these legal and other important papers, such as life insurance, financial information, as well as computer passwords and keys to safe deposit box. Simplify your estate by starting to get rid of your own stuff now. Clean out the garage, attic, and closets — we have too much stuff! By doing this now, your kids won’t be angry with you later for leaving them a big mess. We only use the same 20% of what we have anyway … Reduce! Have that courageous conversation with your spouse or children (if they are old enough). Tell them your wishes for the future, then go the distance and document all this so they have a guidance system when the time comes. 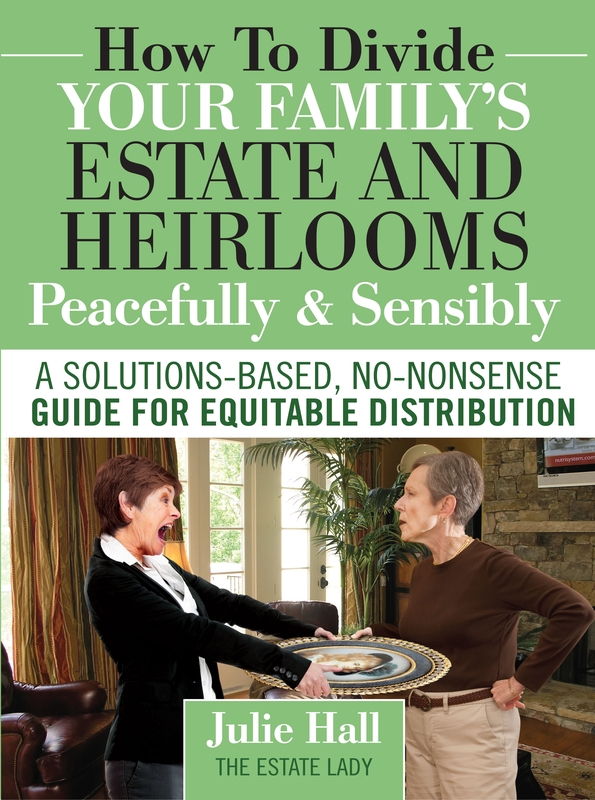 Consider gifting heirlooms and other important items while you are still living. This minimizes future fighting, and you have the joy of seeing the recipient’s face when they receive their gift. Always hire a personal property appraiser for items of value in your own home or your loved one’s estate. Only then can equitable distribution take place. Next week, I’ll give you 6 tips for your parents’ estates. I want to follow up last week’s true story about Carolyn with some simple information about why you need a will. I know what you are thinking right now … “I’m young and in perfect health; why do I need to rush and prepare a will?” No one is guaranteed the length of their days on earth; accidents and illness can come suddenly. A will is necessary even if you feel you have nothing of value. You probably have sentimental items that you wish to give to specific heirs. Preparing a will is a fairly simple process that doesn’t have to be any more complicated or time-consuming than going out to lunch with a friend. A last will and testament is a legal document that gives clear instructions about what to do with your property after your death and how death taxes, if any, are to be paid, along with final expenses that would include any debt and administrative costs. It states who is to receive the property and in what amounts. A will may also be used to name a guardian for any minor children or to create a trust to handle an estate inheritance to protect spendthrift children or others. Finally, and this is important in the case of your parents, a will can be used to name a personal representative or executor to handle property and affairs from the time of death until an estate is settled. You do not have to hire an attorney to make out a will, though I highly recommend it. The law is multifaceted, and all kinds of scenarios can erupt. Depending on the complexity of the will, it will initially cost a few hundred dollars to have an attorney explain your options and then draw up the document. But what Carolyn had written on notebook paper in her own handwriting could have served as a legal will if it were witnessed and notarized … and found. When you consider the years and tears that your heirs and family will endure if you pass away without a will, a few hundred dollars and a legal will becomes the most loving investment you can make in family harmony and peace. Carolyn was 96 years old and had a lovely three bedroom home filled with antiques passed down from previous generations. It was obvious that Carolyn and her predecessors had taken great pride in these heirlooms because they were in immaculate condition. She had done everything right: she left all items in their original condition, she knew the history and stories that went with each piece, and she kept them out of direct sunlight and away from the heat vents. I met Carolyn six months prior to her passing. Her 2 children were present, and everyone wanted to know the values of Carolyn’s possessions from her mother’s and grandmother’s estates dating back to the 1850s. Earlier, the children had spoken with me privately and told me their mother had not prepared a will and asked me to impress upon her the importance of doing so. As I examined each piece, I spoke with Carolyn about the importance of making out a will so she could determine what would happen to all of these valuable antiques, but Carolyn was adamant. “I don’t need a will. I’ve written on a piece of notebook paper my wishes for my children, and that’s good enough. If it isn’t, then they can just fight over it.” And so they would. The children looked at me and grimaced. They knew the complications that awaited them if their mother didn’t draft a legal will: potential years of red tape with hefty attorney fees. Carolyn eventually passed away peacefully, but there was little peace for the family. No one ever found the handwritten note, so it became a game of “Mom said I could have this,” and “No, she promised that to me.” Sadly, it was years before the estate was settled, and no one was happy with the outcome. I wish this story was the exception, but in my experience, it is the norm. According to a Harris Interactive study, 55 percent of Americans have not bothered to see an attorney to prepare a will. Have you??? How different would Carolyn’s passing have been for her family with a little more preparation and a visit to an attorney to make everything official!